I appreciate her final sentence because it would have been easy to demur with something like “We’ll see” or “Only time will tell.” Jubin was evidently swayed by the book’s research and wanted to convey that, in fact, unpopular as it may be to admit this to cynical investing types, she does believe in the underpinnings of 3Sig and thinks it probably will continue outperforming. Thank you, Brenda. I hope others are as open-minded as you are when it comes to embracing a new approach. 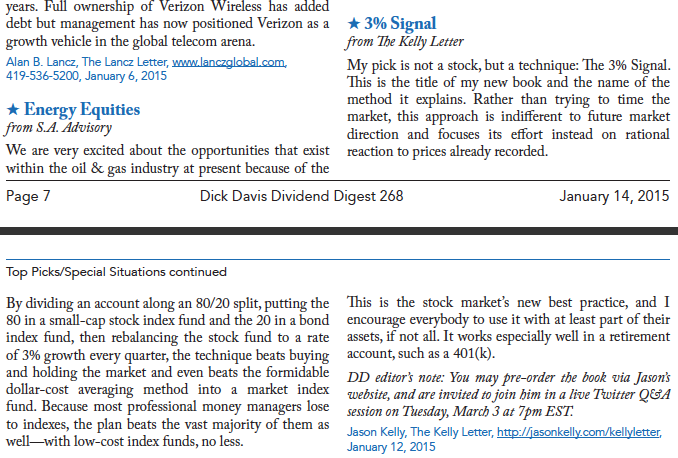 “My pick is not a stock, but a technique: The 3% Signal. This is the title of my new book and the name of the method it explains. Rather than trying to time the market, this approach is indifferent to future market direction and focuses its effort instead on rational reaction to prices already recorded. “By dividing an account along an 80/20 split, putting the 80 in a small-cap stock index fund and the 20 in a bond index fund, then rebalancing the stock fund to a rate of 3% growth every quarter, the technique beats buying and holding the market and even beats the formidable dollar-cost averaging method into a market index fund. Because most professional money managers lose to indexes, the plan beats the vast majority of them as well — with low-cost index funds, no less. “This is the stock market’s new best practice, and I encourage everybody to use it with at least part of their assets, if not all. It works especially well in a retirement account, such as a 401(k). This entry was posted in 3Sig. Bookmark the permalink. Both comments and trackbacks are currently closed.